Very few blockbuster movies go unaccompanied by fast food promotions. Any movie aimed at kids or with a collector/fan interest in the license tends to have a tie-in in a restaurant. The first film in the Lord of the Rings trilogy (LOTR), Lord of The Rings: the Fellowship of the Ring, is no exception - it had a multi-week promotional run at Burger King in the weeks leading up to the film's 2001 theatrical release. The promotion ran from November 19 to December 16. Burger King offered nineteen different toys as well as light-up goblets during the promotion. (The goblets featured Frodo, Gandalf, Aragorn, and Arwen.) 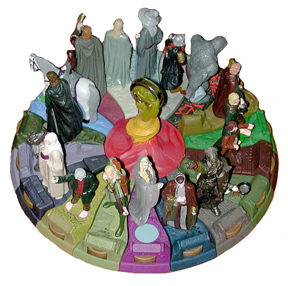 The toys were unique in that if you collected them all, you could form a diorama, with the eighteen character toys circling the "One Ring" in the center. Each toy featured light or sound, with two of the toys (Frodo and Gandalf) having both. Each non-Ring toy came with a separate base, featuring "the One Ring" on the front. If you press down on the Ring, the light/sound for the toy would activate. If you had the toys bases connected to the center One Ring and turned the gold-plated Ring at the top, that would also activate the light/sound for the connected toys via the small switch on the connecting tabs. Some Burger King locations sold the toys without the kids meals, but many did not, leaving collectors to either eat too many fast food meals or resort to eBay. There were several variant versions of some of the toys. The leaflet included with each toy yielded two surprises: one was a mail-in offer for a Uruk-Hai action figure (also requires four UPCs from LOTR action figure purchases) and the other was a "Magic Message." If you went to the BK LOTR web site and entered the Magic Message, you could access a printable form to enter a contest to win a full set of the toys. Click on a thumbnail image of the toys below to see larger pictures, or scroll past them to read more about the variants and the features. The variations in the toys occurred due to changes made during the production of the toys. They were not intentional, but were corrections requested by New Line, the studio producing the film. Bilbo: two versions, one with longish hair and the other with shorter hair and a receding hairline. Cave Troll: two versions, one with a more narrow face and loincloth. Celeborn: two versions, one with silver/gray inner garments, and the other with green inner garments. Merry: three versions, one with blond hair and a green jacket, one with brown hair and a green jacket, and one with brown hair and a tan jacket. Each toy has a unique light or sound, as mentioned above. Some have articulation while others are solid pieces. Arwen: her pendant lights up (red). Poseable at the waist. Bilbo: says, "The Ring must go to Frodo." Boromir: says, "You carry the fate of us all, little one." His head and left arm can be turned. Cave Troll: lights in base light-up (red - cracks in the Mines of Moria). Poseable arms and head. Celeborn: has a yellow light inside the figure. Elrond: says, "You shall be the Fellowship of the Ring." Frodo: says, "Power can be held in the smallest of things." Frodo's foot lights up (green), as if to show him turning invisible. His waist can be turned. Galadriel: glows white when you press the Ring at the front of her base and pink/yellow when the center One Ring is used to activate the light. Gandalf: says, "Speak, friend, and enter." His head can be turned, and the crystal at the top of his staff lights up (yellow). Gimli: says, "Well, what are we waiting for?" His waist can be posed. Legolas: says, "The Ring must be destroyed." His waist can be posed. Lurtz: his shield lights up (red), and also glows in the dark. Merry: the lantern lights up (red), and his head can be turned. Orc: his eyes light up (red), and his head can be turned. Pippin: his torch flame lights up (red), and his head can be turned. Sam: the flames in the campfire light up (red). Saruman: the Palantir lights up (red). Strider: his torch flame lights up (red), and his head can be turned.